It's the year 2097. Human kind survives on Earth only by living underground after destroying their own planet in nuclear war. Research into space travel becomes humanity's only hope of survival. Humanities' eyes turn to the skies in the hope of finding a new, habitable planet on which to start over. Star Ocean: The Last Hope is actually a prequel to the entire Star Ocean series which saw its start back in 1996. The fourth game to release in the series, The Last Hope hit shelves in 2009 for the Xbox 360 and Playstation 3. Developed by Tri-Ace and published by Square-Enix, The Last Hope is a Japanese Role Playing Game with a Sci-Fi setting which is a bit different for the genre. But does the game stand up against other RPGs on the system? 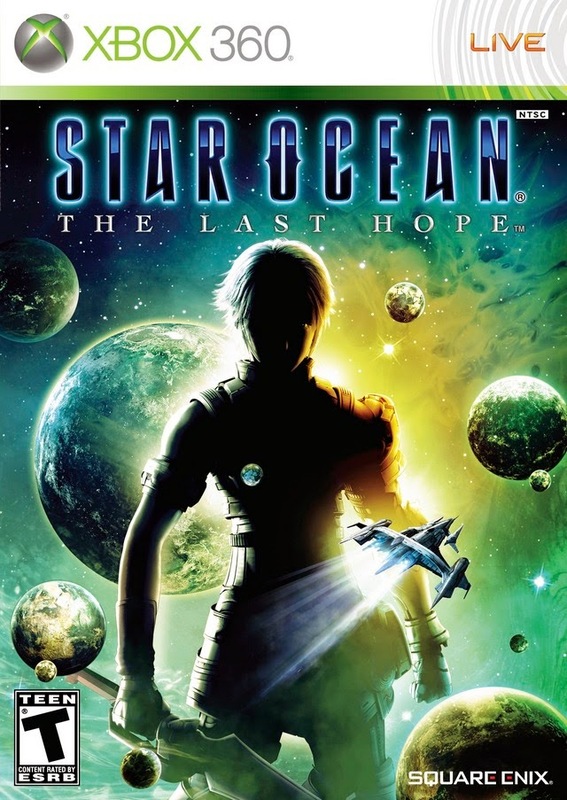 Star Ocean: The Last Hope follows a young man named Edge Maverick who is chosen to crew one of the few warp-capable ships built by humans. These ships share the mission to explore space and investigate new planets in the hope that the human race can find a new home. Along for the ride with Edge, travels his childhood friend Reimi Saionji. The third member of the trio of friends, Crowe Almedio captains one of the other ships. Upon launch, the small group of shuttles experience a warp anomaly and all vessels in the group crash on a nearby planet. 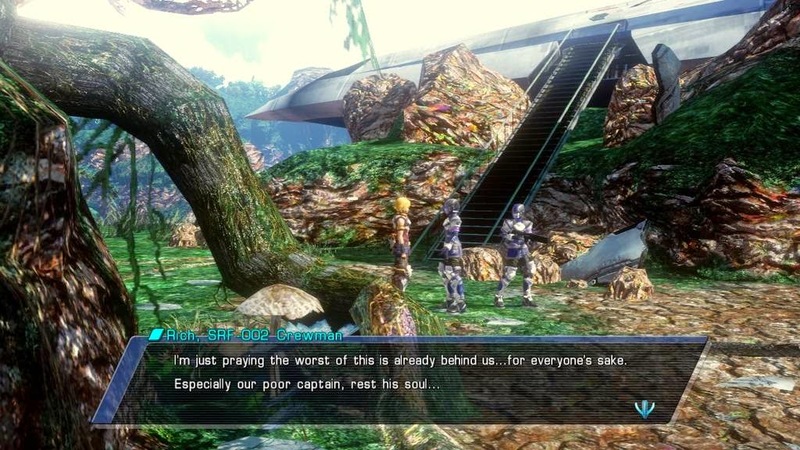 Edge, Reimi, and the majority of their ship's small crew survive the crash, only to realize that their friend Crowe's ship is nowhere to be found. The couple set out to investigate the other crash sites and to hopefully find their friend. During their search, Edge and Reimi find that one of the crashed ships is now without its crew. They find an injured member of the ship's staff who explains to that this ship's crew had found a strange artifact in the jungle, and when they brought it aboard, crew members began to act strangely. This bizarre behavior culminated in the ship's crew turning against, and killing each other. 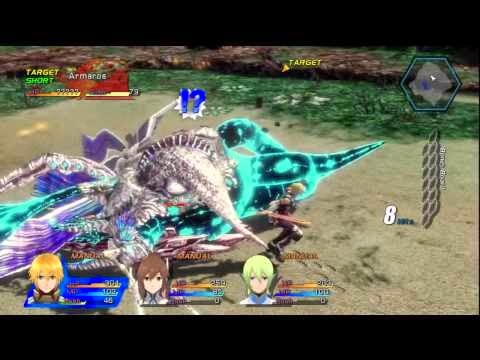 Edge and Reimi are then attacked by a strange creature from the ship. Just in the nick of time, an unfamiliar space ship lands next to the couple and a strange alien, Faize Sheifa Beleth, hops out and assists in the battle. Great, first a psychedelic snail and now a pointy-eared alien, so much for being alone in the galaxy! Upon defeating this creature, Faize explains to Edge and Reimi that he is from a species of aliens which have been secretly working with humanity to assist in the development of warp drives to save the race. After what they had already seen in space, the duo have little trouble believing that there are other intelligent lifeforms in the galaxy. The three then discover the artifact that was taken aboard the crashed ship before the crew went mad. When the three return to their ship, they find that others of Faize's race have landed and already have a base of operations built. The three give the artifact and a briefing to their commanders only to be assigned to a new mission as an inter-species team. This mission is to further explore the galaxy in search of these artifacts that seem to pose a risk to every living thing. Little do the trio know that this artifact is just a small part of a danger which will threaten the entire universe. Faize is only the first of nine characters that players will meet and recruit onto their team as the game continues. Edge will visit 5 different planets, each with different areas to explore and challenges to be met. Party members are just as interesting and varied as the planets they come from. Eventually the team will grow strong enough to combat even the most evil of threats in the universe. Which is good, because there are hundreds of enemies lurking in the farthest reaches of space. Why does there always have to be a weird little girl in these games? The Last Hope plays very similarly to other RPGs with a world exploration mode and a battle mode once combat has been initiated. Players explore the planets freely until running into an enemy (which are displayed on the field as well) in which case a battle begins. 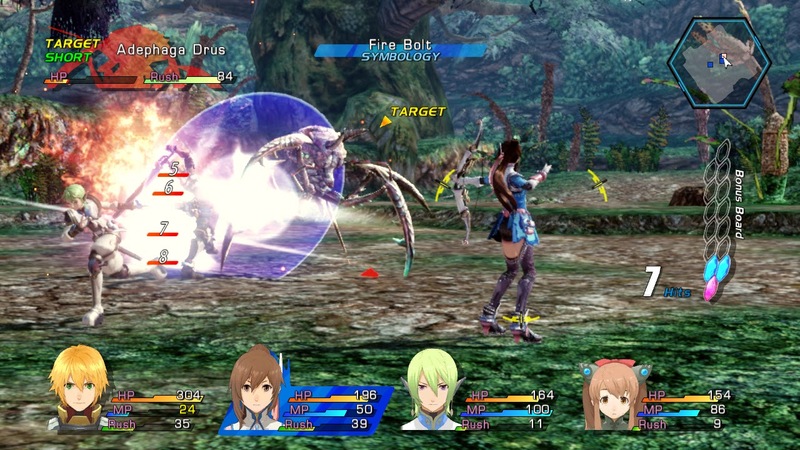 Battles take place in real-time with the player controlling one character on the field while the others are controlled by the AI. Players can set up behaviors for their AI companions, and can control anyone on the field whenever he or she wishes, so it's not as if all control is lost. Each character has his or her own set of skills which can be triggered in battle to turn the tides. 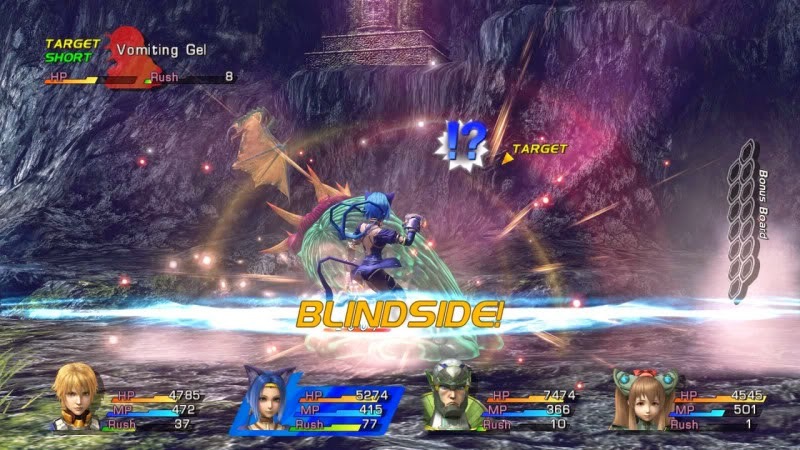 Characters can also initiate Blindside attacks, which confuse the enemy while giving the player an advantage for a short time. Characters also build up their Rush gauges, which when activated offer a variety of perks until the bar runs out. These skills and spells can be extremely cool, especially ones unlocked at higher levels. The Last Hope's graphics are actually quite good for how old the game is. I really enjoyed the enemy design and character models (for the most part...see below). Environments seem to overuse HDR lighting as a way to fake them looking better, but they are still interesting, even if they do try to cover up bad textures with fancy lighting effects. What I really did not like were the character's faces. I know, that sounds weird, but when the game was translated into English it's like they made no effort whatsoever to change the lip movement of the characters. Once you get used to ignoring characters' mouths while they're speaking, things get better, but the character's eyes remain extremely creepy. Every character has dead eyes which never change no matter the emotions being conveyed in his or her speech. It's as if the characters are all evil dolls sent to haunt my dreams. We will devour your souulllll! The game's battle system saves it from falling completely into mediocrity. There's actually a good bit of strategy to the system which I'm sure comes in handy once you unlock higher difficulty settings for the game. There are also a number of mini-games and side-quests throughout the game, in case you want to take a break from scouting out new worlds. 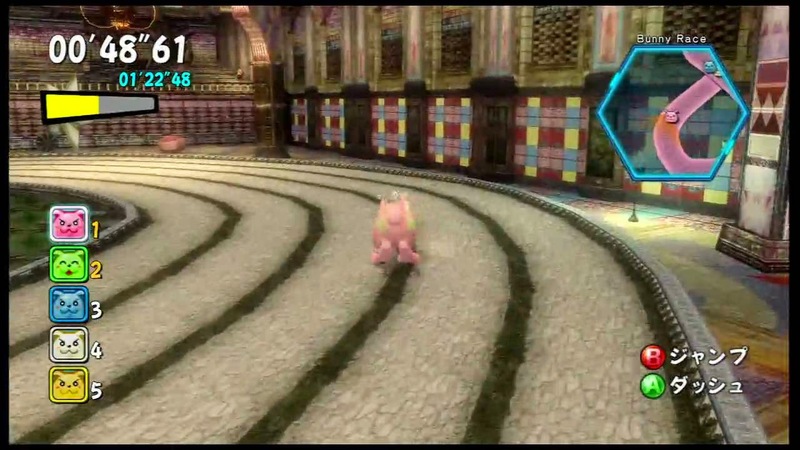 Yes, that's a picture of the giant pink bunny-racing mini-game.. It's also worth mentioning that there is a huge item crafting system in the game. Recipes can be learned by finding them throughout the journey or by grouping together party members in a sort of "brain-storm" mode. There are around 320 items that can be created using this system. There is a lot of gaming to be had here. A single playthrough of the story mode will last around 40 hours. If you wanted to complete all side-quests and mini-games you're looking at more like 70 hours. Once you complete the game for the first time a new, harder difficulty unlocks and will again two more times, if you're into that sort of thing. Personally one playthrough is usually enough for me with a game this long. 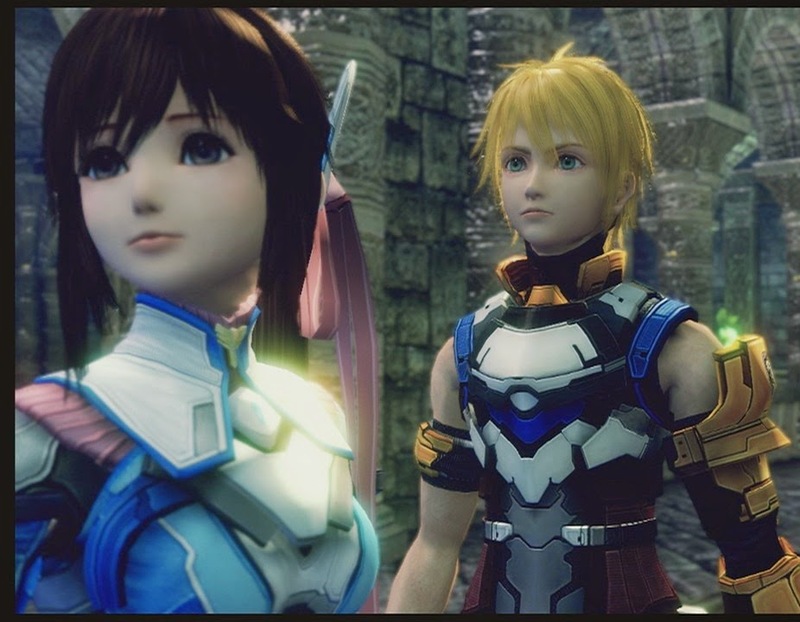 I was surprised at how much I enjoyed Star Ocean: The Last Hope. I am definitely an RPG, JRPG, and WRPG fan, so I guess it's not THAT surprising, but I had heard a lot of bad things about this game. Yes, the story is weak and cliche, the characters are creepy, and the achievements are a pain, but this game is definitely worth your time if you're a fan of JRPGs. There are great planets to explore, numerous battles to fight, items to collect, and side-quests to conquer in this game that will keep you occupied for hours! Follow Amulets and Ale on Facebook at http://www.facebook.com/AmuletsAndAle!